According to pianist and Chopin specialist Janusz Olejniczak, Liu’s performance of Chopin’s Polonaise-Fantaisie during the competition was simply the best he had ever heard. Bronze medal winner of the 2015 International Chopin Competition in Warsaw as well as winner of the highly prestigious Polish Radio prize for best performance of a mazurka, Kate Liu was seen by many jurors and musicians as the Competition’s most original artistic personality. During the Chopin Competition, Liu received the highest score of 10 an unprecedented three times, and won the hearts of her Polish audience with the authenticity of her Chopin playing. Liu studied at the Music Institute of Chicago, and is a graduate of Philadelphia’s legendary Curtis Institute of Music. 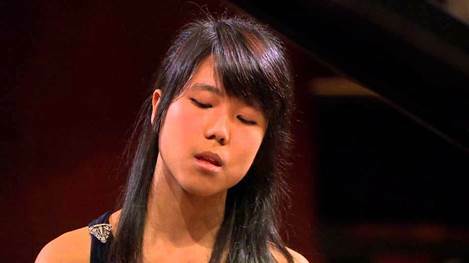 At age 14, she was chosen to perform Schubert’s Fantasy in F minor for four hands with Lang Lang at Chicago’s Symphony Center. We are proud to present the Vancouver recital debut of this remarkable young artist. We know that it will be another wonderful chapter in Vancouver concert history.